New in the Scytheville House is a room repurposed to replicate the home office of Dr. Anna Littlefield, long time New London physician. Born in1859, she passed away in 1952 at the age of 92 years, after practicing medicine for 50 years. She was the first woman doctor in New London. Pictured left is the late Lloyd Littlefield in his family home on Pleasant Street, New London, with some of Dr. Anna Littlefield's artifacts. 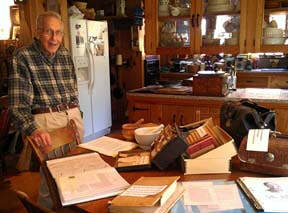 Lloyd's sincere desire to have the Dr. Anna collection at the NLHS was realized this summer. Thanks to the Littlefield family, this room will be a permanent part of the museum collection, complete with examining table, desk, chair, and medical supply cupboard.